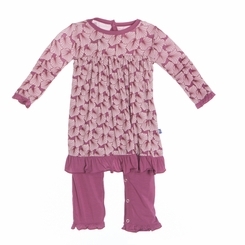 Your little sweetness will be ready for a romping day of fun and play in our fabulous Dress Romper! An easy outfit choice for those busy mornings in this season's charming new patterns. For cuteness from head to toe, pair with our Sock Set and Double Knot Hat.